Home » General Health » A Greater Health Threat Than Ebola? A Greater Health Threat Than Ebola? With Ebola all over the news these days, I find it’s very easy to forget about the far more dangerous airborne illness that’s entering its prime season right here in the U.S.: the flu. At this time of the year, you are likely used to hearing about the latest flu strain—not so much this time around. It’s Ebola that’s front and center. However, the scary truth is that the risks and results of the flu are far more common and much more serious for Americans than Ebola at this time. Every year, about 20% of Americans catch the flu and 200,000 are hospitalized. The Centers for Disease Control and Prevention (CDC) says that anywhere between 3,000 and 49,000 deaths are flu-related. And although it’s hard to say how much of an impact the flu might have this year with such a large range of deaths in past years, it’s clear that the flu is a legitimate health concern in this country. So do you need a flu shot? It really depends. 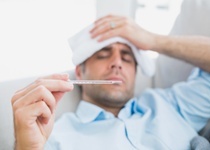 People with weaker immune systems are far more susceptible to contracting the flu, putting them at a higher risk. Therefore, pregnant women, people over the age of 65, young children, and people with health conditions like asthma or diabetes should seriously consider getting a flu shot. Those who spend a lot of time in direct contact with one of the aforementioned groups should also get a flu shot to avoid passing the virus on to someone who is much more susceptible than you may be. Now, I’m normally one to explore natural options before going to the doctor. That said, a flu shot really is your best defense against the flu, especially if you are in a high-risk group. The best way to naturally defend yourself against the flu is to practice a healthy lifestyle. Staying strong, well-rested, and full of nutrient-rich foods really works best to boost your immune system. Try to get adequate amounts of vitamin C and vitamin D by eating foods with healthy servings of each or through supplementation; to get more vitamin D, you can also increase your sun exposure. Some foods to include in your diet during flu season are oranges, chili peppers, red bell peppers, green bell peppers, kale, broccoli, strawberries, squash, and kiwi. So while Ebola continues to be front-page news, the flu should get some of the attention, too, as it is a far more common threat in our own backyard. Be smart: get your flu shot, keep active, and follow a healthy diet. Derrer, D., “Flu Shot: Influenza Vaccine and Side Effects,” WebMD web site, August 27, 2013; http://www.webmd.com/cold-and-flu/flu-guide/fact-sheet-vaccines?page=3, last accessed October 7, 2014.